Independent filmmaker Iffat Fatima takes Jamhoor through her experience of making her recent documentary on the narratives of families impacted by state violence and enforced disappearances in Kashmir. How did you come to make this film, Khoon Diy Baarav? Before I did this film, I was in Sri Lanka for about 6 years. It was there that I was introduced to the crime of enforced disappearances. Sri Lanka has one of the highest number of enforced disappearances in the world: over 60,000 people. So when I came to Kashmir in 2006, I got involved with families who were getting together to collectively demand information about their disappeared loved ones. 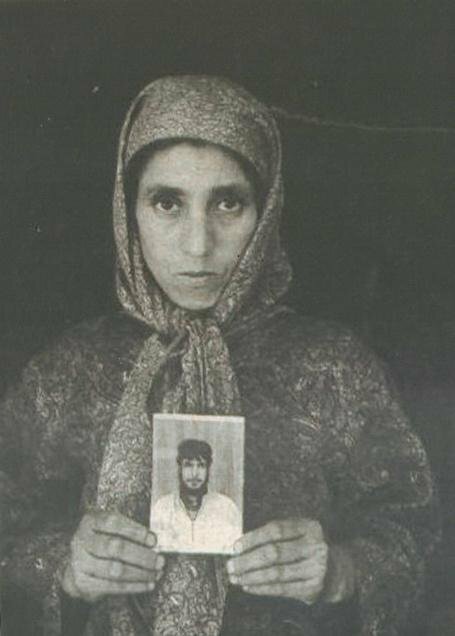 Enforced disappearances had started in Kashmir around 1989, when the armed insurgency began. The disappearances were being used as a counter insurgency tool, a weapon, by the state – to terrorize people into submission in a sense, to kill dissent or resistance. Over time, my involvement became a multi-layered project, of which this film was one part. There is this organization in Norway – the International Association of Women in Radio and Television – which I am a member of. They raised funds for the project through a television campaign. When I first started working with the families, I was mostly documenting everything that happened. Kashmir is one of the most militarized zones in the world. It has the highest number of military forces, not just on the borders but in towns and cities, where people are living. So you know, when the military is so omnipresent, things are bound to happen… people getting killed, all kinds of things. And I was recording that. I didn't have any particular concept or plan, but I was documenting the struggle. And through my engagement with the families, it started growing and taking shape. That engagement, documentation of the living struggle, that was critical. The camera became an agent for the families. When they would talk to the camera, it was as though it was a validation of the struggle. They would understand that it is a powerful tool for taking their issues forward. In 2010, there was a paradigm shift in Kashmir and the freedom movement. People were coming out in the thousands to the streets regularly, and the movement was being brutally crushed. We saw many young people killed. And I felt that it was just time to put it all together. I had 300 hours of material by then! So it was quite a process; I made several drafts. It was very demanding, very personal and emotional, and I had to somehow draw a balance. So that's how the film grew. That’s interesting, because in my own experience, having an emotional relationship to a place makes it difficult for me to write about my research. How did you balance the process of film-making and your emotional relationship to the subject? It’s a huge challenge, because you have experienced this in such a way. See, the challenge I think for filmmakers and artists is to be able to transfer an experience. You can record narratives, but on screen they can be flat. There is an experience attached to them which is not there, which is with you. How do you transfer and translate that experience? I think that is what one is always struggling and striving for but never seems to get quite right. At the same time, you have to be able to detach yourself from the material. So it’s a struggle [to achieve that balance]. In my case, a lot of friends were very supportive, which really helped with the creation of this film. What was the editing process like for you? Did you struggle with different ways of framing the material? Yes, I initially made a slightly different film with the same material. It was called ‘The Vanished Blood’. The film was shown at various places in India, like the Institute of Advanced studies in Shimla, and it’s very interesting – the reaction to that film was extremely hostile. There would be tremendous reaction from the audience—Indian audience largely. They thought it’s very biased. They would get upset. So I reworked the structure. The material remained more or less the same, but in reworking the structure, the film entirely changed and so did the response from the audience. Now, I've never experienced that kind of hostility from an audience in India. So you know, structuring an issue is so important, and I think how you structure is where your politics, or what you're trying to get at through the film, becomes crucial. It’s intuitive in some ways, but also very deliberate and thought out in others. It’s so interesting that you took the audience's response. That takes a lot as a filmmaker, when you’ve invested so much time and energy into putting together your work in a certain way that you can feel stuck to it. How did you come to the decision to restructure the film? Yeah, as I said, my objective in making the film is really to reach out. But reach out with the politics intact. I'm quite clear about that. So it was just a matter of—like you will see, there is a scene towards the end of people forming a circle around a fire and shouting anti-India slogans. In the first film, I had put that at the very beginning. But I think just shifting it around made such a difference in how the audience viewed the film. It’s fascinating. I think it’s very important to understand your location vis a vis your subjects. You have to be able to understand a situation, the dynamics of power, and then locate yourself on one side of it. You cannot just be balanced; that is a ridiculous thing. You have to take a side. So in that case, whether it was Kashmir or Sri Lanka, I was very clear where I am placed. That helps, because it brings some clarity in how one is putting material together. That location anchors you in the subject. How crucial then is the audience for a film? Who did you intend as your audience and how has the film been received after so many screenings? You don't really think about that usually. I had some things in mind, like my primary audience is the Indian audience because, in the long run, it is their voice that will count. So reaching out to them was important. There have been all kinds of responses, some hostile ones too. But largely, after watching, it’s very difficult for people to refute it. When the film is over, I think it is difficult for people to come out with very strong reactions. And, you know, in most audiences there have been one or two members who approach me, like a confession, to say that their fathers are in the army. Usually they are students in colleges and universities in India and they are extremely upset, they are crying. They often want to know what time period the film covers, so in their mind they are working out, ‘Was my father there, could he have been involved in something like this?’ It’s a struggle for them. But, you know as a filmmaker you don’t really expect that people will get transformed. I think that expectation is misplaced. You do hope that whoever sees the film, will in some way be moved, will start thinking. Parveena, one of the women in the film who started the movement against disappearances, often accompanies me to screenings and her presence has such an impact on the audiences. People often ask her, tell us what can we do. She says, now that you have become witnesses to what has happened, it is incumbent on you to take this forward, in whatever way. Jis ko likhna aata hai woh likhe, jis ko art banana aata hai woh art banaye, jis ko sochna… [writers should write, artists should make art, thinkers should…] So that's the thing; it’s not that a revolution will happen, but you hope that in some way [your work] carries certain mobility. Can you tell us about the name of the film and why you chose it? Khoon Diy Baarav is something that the families, the affected families in Kashmir, use all the time. It’s on the tip of their tongue, so to say. It’s a complex saying; translating it effectively is almost impossible, but how I see it is that blood that is shed – the assumption is innocent blood through oppression and violence – will not be wasted. It will sediment, in the form of memory, and it will re-emerge in the form of resistance. So resistance becomes the key word, because resistance is all about justice in a situation like this. There is no scope of justice from the Indian state in Kashmir. It hasn't been coming from the last sixty years, and there is little expectation of it in the near future. But, I think, oppression becomes unsustainable in the long run. It might take a long time, but it’s ultimately unsustainable. We've seen that through history. The film brilliantly traces everyday forms of resistance. Resistance is not documented only in the form of a movement or an event, but life as resistance, memory as resistance. It also amplifies the voices of women by highlighting forms of resistance that are less visible. For instance, when we think about resistance, the image or idea that comes to mind is not necessarily of song or memory. Can you tell us more about such kinds of resistance powerfully captured in your film? I think resistance is an everyday thing. It’s not necessarily big moments; it’s about how personal memory gets transformed into a collective resistance in some way. Some of the women that you see here, their husbands have been disappeared or killed; they’re single women bringing up their children. That is tremendous resistance. It is very difficult to be doing that, and at the same time making sure that their disappeared husband remains alive in a certain way in the public space. They assemble every month in a public park and demand information about what's been done. I mean, it may even be twenty or thirty years since their family members have been disappeared… It’s painful to do that; you'd rather forget and move on in your life. So to be able to resist those pressures needs tremendous resilience. Otherwise I think the whole system is geared towards forgetfulness. Your film captures how absence can be empowering and from absence comes an empowered form of resistance. Can you tell us more about that? Yes, as I said the state is bent upon erasure. Not only erasure; it wants to impose its own narrative. It makes our truth into lies and their own lies into truth. It’s a constant battle. Parveena always says that truth will prevail. Maybe not now… but that’s her belief. I think there is a certain faith aspect as well, that helps perhaps in this process of long-term struggle. Belief that maybe there is a higher power somewhere, which very much helps them and gives strength. It reinforces a certain hope for justice because it’s also power – you resist power through a higher power. It’s a complex web of reasons that sustains resistance in such difficult conditions. But I think the more the oppression, the stronger the resistance and these states, they never learn. They seem to think that military solutions can resolve a problem. But it has never happened – there cannot be a military resolution to a political problem. They must find political ways of dealing with issues like Kashmir. They just want to erase it and say it’s a problem of Pakistani terrorism. But it’s not that – there are people who have for years formed a movement and they have been struggling. There is an aspiration and passion for azaadi, for freedom in Kashmir. It’s not something that will die down. If it had to, with the kind of military power that has been used there by now, it would have been dead and gone. But it re-emerges, resurfaces in different forms. What are some of the dominant themes, voices, or thoughts that came up in the narratives of Kashmiri women that you encountered making this film? I think what really became evident for me, personally, was the way women use language. It is just fantastic, you know, to express their deepest feelings or emotions – they really know how to use language. Men don't. Because men talk in terms of larger narratives, they will talk about politics; it’s a different way of using language. But women use language in an extremely personal, and very poetic way. You see that even in the film. That was something that really struck me. For women, language becomes a mode... and in Kashmir, this language has always had layers and layers of history within it. Because in Kashmiri language, like say during weddings or during mourning, or even while sowing or harvesting, people sing songs. They’re based in certain folk tradition but they also keep improvising. In the film, you saw them singing to the mujahid. There was a woman singing to her husband and to resistance as well. So that gives you a sense of how pervasive and how deep rooted this resistance is. It has entered the very nervous system of the society so that it gets expressed in these forms. Yes, the songs of women working in fields were a powerful expression of life and resistance shown in the film. Tell us a little bit about the role of women in Kashmiri society facing the brutality of occupation and enforced disappearances. Violence brutalizes society. You know, Kashmiri society has been tremendously brutalized over the years. And, also, coming to the gender question in a place like this, which is under such tremendous pressure, the categories or roles just do not exist in that way. Men are generally picked up or killed, and the women have to handle the situation so they are forced to get into the public arena, and they adjust to it very vehemently and forcefully. So the division of gender [roles] gets blurred in such situations. Switching tracks a little, the mainstream media in India has covered soldier testimonies about righteously using pellet guns against children and youth. What is the impact of such discussions in the mainstream? Yes, well, in some ways [there is an impact], but I think the Indian people are also very ill informed about what is happening in Kashmir so they buy into a lot of state-sanctioned information because it feeds their own nationalistic tendencies. Because the violence hasn't reached them you know—like it got to JNU and they were shaken, because they saw what Kashmiris were experiencing on a day-to-day basis. But those who have not experienced this [directly] just live in a nationalist bubble. What is alarming to me as someone who grew up in a militarised region in India’s North-East is that the general public opinion on Kashmir can often be far removed from their otherwise critical stance on militarisation. I think it’s because of the way that politics is constructed, the way that power controls discourses; it’s a battle on all fronts. The discourse built in India around [the conflict in] Kashmir is dominated by the role of Pakistan and the fact that there is terrorism. What is actually the problem is completely lost and erased in these discourses. And, you know, that becomes a way not to deal with the problem, because it’s said to be so complex that it cannot be resolved. They haven't learned anything from Partition, which polarized the region along religious identities and saw so much horror, bloodshed and disaster. It’s absolutely important that these issues get addressed by respecting the aspirations of the people. Travelling internationally with your film, what kind of engagement are you looking for with Kashmiris and the Kashmiri diaspora? My first screening was in Kashmir. It was on the 30th of August, the International Day of the Disappeared. Many of the families of disappeared people were there. There is no cinema hall in Kashmir so it was shown in a hotel – extremely emotional, charged screening. Then, I had an eye-opening experience in Britain at my screening last year. I had never met people who considered themselves so strongly to be Kashmiri and yet were not Kashmiri-speaking. It’s a large community in Britain from Mirpur etc. They have such an emotional response to the film, many of them cry a lot, and have such a sense of nostalgia. Many of them said we must start regrouping again. So their engagement is largely at an emotional level, validating and reinforcing what they feel. It also happens with Kashmiri students in India – the film empowers them in some way, because they are always in a minority and they find it difficult to talk. But [the film] gives them a certain validity perhaps. Was there any conversation about how the movement connects with other movements that are also pushing back against this hegemonic nationalism in India? At the moment there is very little of that happening in India. There are some fringe groups, like in JNU, which are struggling themselves to survive under the conditions. At an individual level, I have received solidarity from all kinds of people, lawyers, activists. But it’s very difficult to form collective solidarities in these times. The BJP have really changed India in many ways in the last 4-5 years. They are controlling all the institutions. The moment anybody says something about Kashmir it is sedition. They actually file sedition cases, and then you have to go through the courts which nobody wants to do, and you are marked and harassed. I mean, movie screenings in Indian cinemas often begin with the national anthem, and you can be jailed for not standing up. So it’s largely fear that keeps people away from these movements. Sometimes it’s easier to connect over human rights but that becomes difficult in the case of Kashmir, because it has been made into a terrorism issue, and [supposedly] it’s okay to kill terrorists. When there were problems in Punjab, they deployed the paramilitary but not the army. Even in Chattisgarh, the army refused to go in, saying these are our own people. But Kashmir or the North-East are places where they have deployed the army in civilian areas. So there are multiple roadblocks to forming those collective solidarities. Right, and it’s important to think about the impact of the brutalizing violence on the psyche of Indians. The corporate media and the state mobilising the language of us versus them, the threat of religious extremism, and Pakistan’s interests in the region (albeit also an occupying state in Kashmir). In this political climate across South Asia and in the time of intense Islamophobia globally, what do you think solidarity can look like? In the introduction to Wretched of the Earth by Frantz Fanon, Sartre writes that he’s not so concerned about what is happening to the Algerians, but in fact, what is happening to the Republic of France: “In other days France was the name of a country. We should take care that in 1961 it does not become the name of a nervous disease.” I think it’s extremely important to think about the effect on the Indian psyche when this kind of brutality happens in their name. And I think the responsibility is with the Indian civil society, the Indian people, to assess that and respond to it. We have seen time and again that resistance, say for instance against the Vietnam War in the United States, is what has put an end to war. It is extremely important that something like that happens in India. At the moment, it seems far removed because the larger Indian public is controlled through this fervour of nationalism and all kinds of retrograde ideas through the media, through all modes of governance and power. But it’s a fallacy that [the conflict] is not affecting them – actually it is affecting them in so many different ways. Materially, if they can resolve this problem, I think South Asia would be a different place. If we thought of imaginative new ways of resolving this issue, it can create modern forms of state formation, and sovereignty actually. The idea of sovereignty is such an old fashioned and retrograde idea, which needs to change, and Kashmir is ideally placed for bringing about that kind of transformation if only there was some kind of political will to do that. Iffat Fatima is an independent documentary filmmaker from Kashmir, currently based in Delhi. Her previous films include: “Lanka – the Other Side of War and Peace” (2005) on the issues of memory and violence in Sri Lanka; “The Kesar Saga” (2000) on storytelling in Ladakh; “In the Realm of the Visual” (1998) on one of India’s most prolific and versatile artists and designers, Dashrath Patel; and “Boojh Sakey Tou Boojh” (1996) on the contemporary understanding of 13th century Sufi poet and scholar, Amir Khusro. Her films have been screened at notable venues and film festivals in India and across the world.